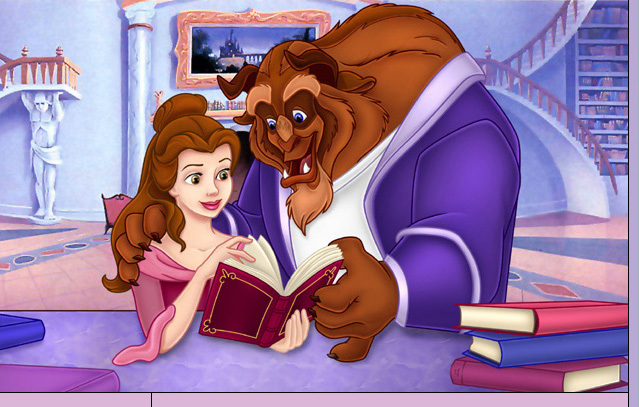 There are various books that Belle mentions and describes in Beauty and the Beast. We can deduce that she has read all of the books in the bookseller's shoppe because when she returns the book at the beginning of the movie, she asks him if he has gotten anything new, and she ultimately chooses a book that the bookseller says she has read twice. The first book mentioned in the movie is Jack and the Beanstalk. The book title is not given, but Belle describes the book to the baker as being about a beanstalk and an ogre. When Belle continues on her way after stopping with the baker and arrives at the bookshop to return the book, there are no new books "since yesterday" and she borrows a book that she has read twice before. She describes it as being her favorite, and goes on to say that it contains "far off places, daring swordfights, magic spells, and a prince in disguise". The bookseller allows her to keep the book and she leaves the shoppe and arrives at a fountain, where she tells the sheep that her favorite part is arriving, the part where "she meets Prince Charming, But she won't discover that it's him 'til chapter three!" Although the name "Prince Charming" is mentioned, it leads me to believe that Belle is reading Sleeping Beauty, because Aurora does not discover it is Prince Phillip until later on in the movie. Also, Sleeping Beauty contains far off places, daring swordfights (Prince Phillip versus Maleficent as the Dragon), magic spells (both by The Fairies as well as by Maleficent), and not necessarily a prince in disguise, but a prince whose identity is not yet known by Aurora. Belle has undoubtedly read many more books than these, but these are the main ones mentioned or discussed in the movie.